New Anritsu synthesizer technology permits frequency to be set with a resolution of 0.01 Hz across the full frequency range. And the non-harmonic spurious is better than -100 dBc for reliable measurement at any frequency. 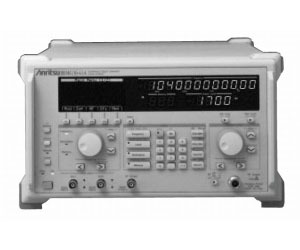 A unique low-noise YIG oscillator produces a high-purity signal with SSB phase noise of better than -130 dBc/Hz (1 GHz, 20 kHz offset) making these signal generators for interference testing of radio receivers and as sources for various local and reference signals. The MG3461A supports a range of 125 kHz to 1040 MHz.